Known the world over by its nicknames of Windy City and Chi-Town, Chicago is one of the America's biggest and most populous cities. It's the largest city in the entire Midwestern United States and boasts a population of over 2.7 million. Located on Lake Michigan in Illinois, Chicago is one of the most culturally significant and influential cities in the entire United States, well known for its stunning skyline and rich history. This city, like the entire state of Illinois, is located within the Central Time Zone. Ranked as one of the best cities in the world for quality of life, Chicago is a hugely popular place to live and visit. Statistics show that it's the second most visited city in the entire US, with tens of millions of visitors from all around the world coming to enjoy Chicago's rich history, beautiful architecture, museums, professional sports teams, universities, rivers, and more. French explorers and settled founded the city in the early 19th century and it swiftly grew into one of the most important locations in the US, identified as a key transport hub between the eastern and western states. Over time, Chicago grew and grew, becoming the home of the world's first skyscraper in 1885 and building up one of the most impressive skylines in the world, with a rich blend of old and new architecture. Boasting one of the busiest airports on the planet in O'Hare International Airport, Chicago is a major tourist destination due to its cultural significance. The city has played a key part in various musical and architectural movements around the United States and internationally, and boasts a rich culture involving film, theater, food, and more. The city has the distinction of not relying on any one major industry to dominate its production, instead boasting a highly diversified and balanced economy with a wide variety of industries including finance, food production, manufacture, publishing, entertainment, retail, and more. Tourism contributes greatly to Chicago’s economy too, with the city enjoying lots of cultural landmarks, museums, outdoor activities, and professional sports teams in all of the major leagues of the United States. The time zones used throughout the United States in modern times weren’t introduced until the late 19th century. Before then, the sun was used to tell the time. Clocks would be set at midday when the sun passed over the meridian of each town or city, meaning that the time in one place would be at least a little different from the next town or city further down the road. Over time, this system became increasingly problematic, and a new system clearly needed to be introduced. In 1883, the idea of separating the contiguous United States into four distinct time zones was introduced. It was at this point that the Pacific, Mountain, Central, and Eastern zones were created, and the entire state of Illinois was placed in the Central Time Zone. This meant that the city of Chicago would also observe Central Time. The Central Time Zone (CT) applies in all of Chicago and the rest of Illinois, as well as covering many other parts of the US. The Central Time Zone, like the other major time zones in the United States, split into two forms: Central Standard Time (CST) and Central Daylight Time (CDT). Central Standard Time is six hours behind Coordinated Universal Time (UTC), while Central Daylight Time is five hours behind UTC. The latter is used during periods of daylight savings time. As well as Chicago and Illinois, the Central Time Zone covers eight additional states in their entirety. Central Time is also observed in parts of 11 additional states, for a total of 20 states overall. This time zone is also used throughout the majority of Mexico and in some territories and provinces of Canada, as well as several Central American countries and Caribbean Islands. The entire state of Illinois, like the vast majority of US states, uses daylight savings time for several months of the year. This system therefore also applies in the city of Chicago. 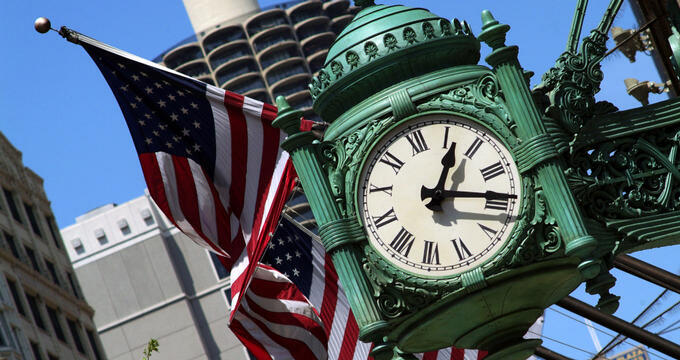 Since the Energy Policy Act of 2005 was introduced, daylight savings in Chicago and elsewhere around the United States begins on the second Sunday of March and runs through to the first Sunday of November. During this period, Chicago observes CDT. Then, from November through to March, CST is used.